A hard drive is a computer component which stores important files and programs for your desktop PC or laptop. The newest introduction for super fast storage is the Solid State Drive (SSD), maximizing performance with greater portability. So choose a storage option to cater to your individual needs and let OneShop be your guide for the most reliable hard disk drives on the market. ADATA 2.5 1000Gb SP920 All content and descriptions copyright NGR Computers and their respective owners. The Hard drive... More than just a component. A hard disk drive, more commonly known as a hard drive or HDD, is one of the most essential components for data storage on a computer system. The hard drive stores the computer's operating system, programs and data files. This internal component is called a "hard" disk drive because of its physical box-like aluminum housing appose to the plastic floppy disks that were used to store smaller pieces during the last decade. The hard drive is capable of holding millions of bytes of information, with capacities ranging from 10 to 500 gigabytes (500.000.000.000 bytes) which is the currently the most popular hard drive capacity for PC owners. The introduction of the first data storage component was in the 1950s and mainly used by a select few computer companies like IBM and Apple. The practical implications were soon realised and in a span of 20 years most additional storage units like the hard disk drive were already installed into personal computers. A example would be the cassette and video tape devices. These two mediums used long strings of magnetic tape to store bits of information on a thin surface. Similarly, Hard drives use round aluminium platters with a mirror-like shine to store information on the same magnetic recording surface. The earliest hard drives in the 1980s could hold a maximum of 10MB but due to technological advancement in the data storage sector, drive capacities have doubled every few years, giving us the high storage capabilities, like the widely sold 500GB hard drive, we see today. The design of a hard drive is fairly simple, with parts manufactured closely together and wrapped in an aluminium casing. 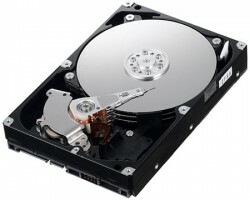 Each time when you boot up your computer, the platters on a hard drive begins to spin and with each rotation of a platter, new infomation can be written; this means the performance of a hard drive depends on the rotation per minute(RPM). Desktop computers have hard drives that spin at 7,200 rotations per minute, but laptop hard drives have a general rotation speed of 5,400 RPM, making home computers the optimum choice for general file transfer or media playback from hard drives. Today's hard drives use Serial ATA (SATA) interfaces to replace older IDE cables. SATA cables have a host of advantages over IDE such as faster data transfer, cost efficient size and less conductors. If you purchase a new hard drive, chances are that it will contain SATA interface capabilities instead of the older IDE standard. The 21st century was a great time for mass storage units such as the hard disk drive. Where 80GB was the norm, today we have capacities of 1Terabyte (1024GB) and more. So whether you building a new desktop PC or simply upgrading from older drives, you will definitely find the best hard drives for your computers storage demands. Hard drive prices have been dramatically reduced in recent years and in turn we see capacities increasing on an annual basis. OneShop has the best prices from trusted online retails from your favourite brands such as Seagate or Western Digital. Read hard drive product reviews, checking ratings for the latest hard drives and get relevant information to make the best decision for additional storage for computer.